Although argan oil might sound like the latest flavor-of-the-month in terms of so-called miracle ingredients in the beauty industry, it has limited but promising research to back up its use. 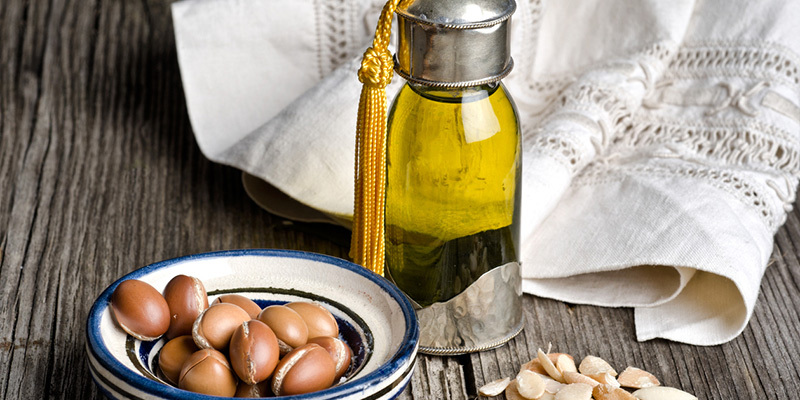 Dubbed “liquid gold,” argan oil is a highly-sought after skin care ingredient worldwide. The vitamin E-rich argan oil has also been quite popular in France for some time. For years, English and French tourists have been known to return with argan oil from vacations in Morocco. It is worth noting that the cultivation and harnessing of this resource endemic to Morocco are now being fostered by the Moroccan government, which helps to fund the argan cooperatives of Berber women who grind the A. spinosa fruits to extract the oil. Argan oil is derived from the fruit of the Argania spinosa tree, which is native to the arid climate of southwestern Morocco. Once prevalent in North Africa, the A. spinosa tree is presently grown only in Morocco, and although it is the second most common tree species there, it is considered endangered, so its oil, which is labor intensive to obtain, is becoming somewhat rare (Journal of Ethnopharmacology). Argan oil has been used for traditional purposes, including as a medicine, for several centuries (Pharmacol. Res. 2006;54:1–5). There is a paucity of research on this botanical compound, and most of the investigations have focused on the cardiovascular benefits of virgin argan oil consumption. However, there are a few argan oil studies for the skin worth noting. Argan oil is rich in linoleic acid and oleic acids. Although the exact composition of argan oil varies depending on how and when it was sourced, most argan oil contains about 35-40% linoleic acid and 42-48% oleic acid. Why does this matter? An omega-6 unsaturated fatty acid, linoleic acid has been shown in studies to be capable of reducing inflammation and acne, and increasing skin’s moisturization levels (Journal of Ethnopharmacology). On the other hand, oleic acid is a omega-9 monounsaturated nonessential fatty acid. Oleic acid is believed to increase skin’s permeability, helping other ingredients penetrate the skin better (Journal of Controlled Release). Oleic acid is also commonly found in olive oil and acai berry. One study worth noting about the topical action of argan oil shows it may reduce sebum production. Hristo Dobrev of Medical University Plovdiv (Bulgaria) assessed the efficacy of a cream for controlling sebum. The cream was composed of saw palmetto extract, sesame seeds, and argan oil, and was studied in 20 healthy volunteers—16 with oily facial skin and 4 with combination facial skin. During the winter months (January and February), participants applied the formulation to the face twice daily for a period of 4 weeks (Journal of Cosmetic Dermatology). Results indicated that all of the volunteers tolerated the product. In 95% of the participants, a visible sebum-regulating efficacy was observed. In addition, clinical evaluation scores and sebum levels declined significantly after 1 month of treatment. The researcher concluded that this argan oil-containing formulation was efficacious in mitigating greasiness and the appearance of oily facial skin. Argan oil is the key ingredient in a line of products manufactured by Issahra Argan Cosmetics, and made available through Argan Body LLC. The product line includes Argan Oil (100% organic), Age Control Day Care (with argan oil), and Argan Creamy Milk Face Cleanser, among other products. Argan oil is also included in the Superskin Concentrate product by Liz Earle, Naturally Active Skincare, as well as in several formulations by Kaeline Argatherapie, available through Xandra Renouvelle. In addition, Laboratoires Serobiologiques, based in Pulnoy, France, has developed proprietary ingredients such as Arganyl, for antiaging indications, and Argatensyl, specifically to combat wrinkles. My favorite argan Oil product is PAORR Oil (sounds like “power” and stands for Powerful Antioxidant Oil). It is the extra virgin form of argan Oil for Morocco. It is my favorite oil for rosacea-prone patients because it has linoleic acid in it, which strengthens the skin barrier and helps reduce inflammation. It is the perfect treatment product for DSNW and DSPW Baumann Skin Types®. It can be found here using the doctor code DRB or through your dermatologist. The body of research on argan oil is notably scant. However, preliminary studies indicate it is a solid source of moisturizing omega-6 and omega-9 fatty acids, and it also may have sebum-reducing action that may be particularly helpful for those with acne-prone or oily skin types. (Not sure of your skin type? Find out here with Skin Type Solutions!) Argan oil’s traditional uses and inclusion in novel products (as one of the latest ingredients of the moment in the beauty industry) suggest that further investigations are warranted and likely to be forthcoming. The little evidence that is available, however, does appear promising.